Should have contributed in many areas, i.e., western shows, English shows, 4-H, Rodeo -- Little Britches and High School, trails, legislation, clinics and other equine related activities. A mature individual, "long term commitment." The individual should have excellent character. The individual will likely be recognized by members of many horse-related groups, and perhaps by the general population. Gary Raak, of New Prague, MN was honored by the Minnesota Horse Council with former Horse Person of the Year (1998) recipient Dan Dolan assisting in the presentation. Raak’s horse career started back when he was just 9 years old, showing horses, cows and sheep in 4-H. Even today, he remains a strong supporter of the Washington County 4-H program, the Dakota County 4-H program as well as the State 4-H Horse Show. Around age 11 he picked sweet corn and hoed strawberries for Earl Creck of South St. Paul, working 60 hours a week and taking home $28. By the time he was 14, he had saved enough to buy his first Appaloosa stallion named Chief Joseph Hi Spot from a gentleman named Teddy Frederick. It wasn’t long before he made another trip back for some mares. The following summer he worked for Green Giant and bought a Model A Ford. He also bought a 1950 Ford for $50 and wasn’t yet old enough to drive it. Raak’s family boarded horses for some wealthy clients and on occasion they would give Raak their older horses. By 15, Raak was showing horses at the national level and won his first National Championship at age 16 in Springfield, IL. He had to learn to work to support his horse showing and after brief stint working the night shift at a local Clark Super 100, he learned working on the family farm was going to be less disruptive to his sleep schedule. He rode horses, cleaned stalls, raised chickens, milked cows, fed and trained horses all while participating in sports at school. After high school he attended St. Paul Vo-Tech to become a sheet metal worker. He underwent two back operations and the sheet metal career was out the window. When he was 22, Raak bought a mare for $600 and sent it to a trainer by the name of Teddy Simon. The mare turned out to run AAA time on the track. He soon sold the mare for $3,500 to Daryl Dickenson. Continuing to grow his business ideas, Raak took that same $3,500 and purchased 6.5 acres on Highway 52. He built a barn which started out with just 6 box stalls and 4 tie stalls. This modest beginning soon expanded into 125 stalls and 6 full time employees to handle his new breeding program. At one time he stood four stallions. One of those stallions was Abdul Pok-A-Son, who became a leading sire of broodmares. He won the National Western Stock Show in Denver, CO in Western Pleasure and was National Champion in halter in Syracuse NY, soon his program was off and running. Eventually, Raak started selling horses overseas. He would ship 20-25 horses each month, first hauling them to Montreal, Canada where they would then be put on airplanes. One of his most prized stallions was Rock Star by Skipp A Star. Rock Star was a leading sire of Halter and Performance horses, having sired 50 National and world Champions. Raak had Rock Star syndicated and this was the beginning of the Rock Star Futurity, which was for babies sired by Rock Star. The festivities always started with a dinner and reception the night before. Babies were judged in a round pen by a 3-judge panel. Special handlers would work the babies both ways. First place paid out $10,000 and belt buckles were given for 10 placings and he even had a pari-mutuel betting window handle odds for the winning colt. Raak built horse walkers from truck rear ends. He bought pipe and used the barn as his factory. He soon started building starting gates for race tracks. Eventually he got into horse sales, putting on his first one on Atlanta Georgia, the South Spectacular. For that first sale, which was held in February, he hauled 60 horses in so he would have stock to sell. He expanded to Los Angeles, putting on the West Coast Spectacular. He also held sales in both Wisconsin and Florida. At the age of 40, he started selling horse trailers out of the property he had on Highway 52. In 1993 he moved to the present location on Interstate 35, Exit 76 where they are presently located. Raak has over the years donated the use of trailers to various organizations. Including the Appaloosa Horse Association – donated 6 trailers to date; State 4-H Association – donated 4 trailers to date; Reining Horse Show – National Reining Breeders Classic – donated 6 trailers to date; and even one to the Elko Speedway. Raak has been an exhibitor at every single Minnesota Horse Expo since they started over 30 years ago. He was even asked to help conduct a multi-breed horse sale at one of the earlier Expos, which went off with much success. 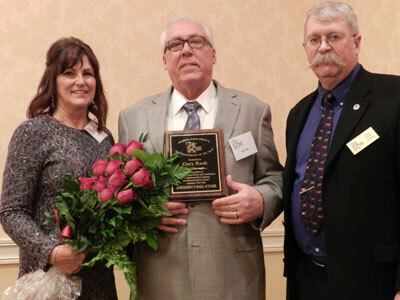 Gary Raak has been an influence to the horse industry not only in Minnesota, but at a national level as well. He has made a life-long commitment to the industry through his involvement in the showing, training, and breeding, holding futurities, running a successful horse trailer sales business and he continues to be a benefactor to so many of our youth. Raak and his wife Tammy, helpful partner and best friend show Appaloosa/Quarter horses at the national level. Several friends and family members were in attendance to recognize Gary for his accomplishments.